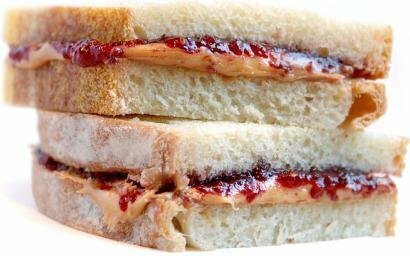 This recipe is for the classic peanut butter and jelly sandwich. Feel free to get the creative juices flowing and embellish as little or as much as your heart desires. Spread one slice of bread with peanut butter. Cover with other slice of bread with jelly or jam. Put the two slices of bread together. Cut sandwich in half at a diagonal and enjoy with a glass of milk.